In the old days, when 700 C wheels were scarce (27" dominated road bikes and mountain bikes weren't even invented), all performance wheels were tubulars. The Michelin Elan was the first really small racing type tire introduced in the early 70's. All racers rode tubulars exclusively. Dealing with the glue and expense was part of it and no one really gave it a second thought. Clinchers now have evolved to the point where they can be competitive with tubular tires (especially now with the wider rim versions) but if you want the best performance you need to go tubular. Both the tires and rims are lighter. Most of our tubulars are sold during cross season where the vast majority of cross racers use them. 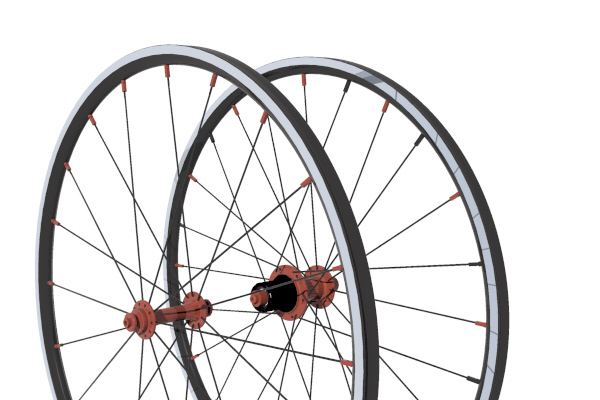 Ours have our 22 mm wide rim (wider holds more glue and is much better for cross) and, of course, are internal washers on the drive side rear spokes. They are also seriously light at 1320 grams for the set. I often ride tubulars and put tire sealant in them. I find that the sealant will take care of almost all flats and that the only time I need to take a tire off is when it's worn out. Another great alternative is to carry the sealant with you and if you get a flat instead of changing the tire you add sealant an pump it up. Size: 700C Tubular (glued on tires - if you don't know what these are they most likely are not for you). Weight 1320 grams (without skewers or rim strips) weights can vary by about 50 grams a set due to rim, spoke, and hub weight tollerances. Spoke Tension Rear Drive Side: 170-180 KGF (on a Park Tensiometer 18-19 for CX Ray and 22-23 for Laser). My 50mm race tubulars cracked after 4 years of duty. They didn't owe my anything. This time around I went with aluminum tubs...because where I live there is wind, rain and potholes & 50mm carbon wheels don't care for any of those things. The Neugent wheels were a great value. 1300 gram wheels that are 22mm wide with a GREAT aluminum brake track. I am very happy with these wheels. They are plenty stiff for those big efforts and the hub bearings are surprisingly smooth. Disassembling the hubs is a simple matter making maintenance an any man job. Add some sealant and you could train on them as well (I've been). Deep rims have their place...but I feel just as fast on these wheels as I did on the 50mm carbon's...They are lighter and they have an aluminum brake track so they accelerate and stop a little quicker. I would buy them again...the crash warranty I purchased ensures not having to for at least 2 years.